It was cold and raining when I left West Brompton to travel to Wandsworth Common. One of those rather irritating trips that isn’t far but somehow seems a little awkward. As a result, I arrived at the Good Earth, umbrella in hand feeling somewhat grumpy. 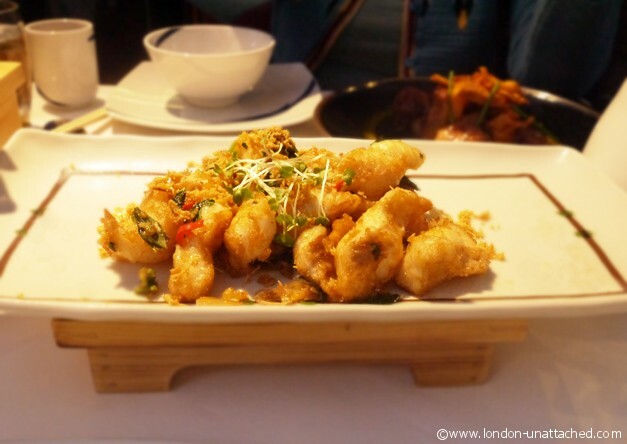 The Good Earth Chinese Restaurants have existed in and around London for over 30 years. And, whilst I’ve walked past them on occasions when I haven’t been looking to eat, I’ve never actually been to one for a meal. When I did live in Clapham, within walking distance of what is now The Good Earth on Bellevue Road, the venue was a large cafe. The interior now has been transformed into something that sits comfortably in between a traditional Chinese restaurant and a Bistro. In fact, if the concept of Chinese Bistro existed this might just be one. 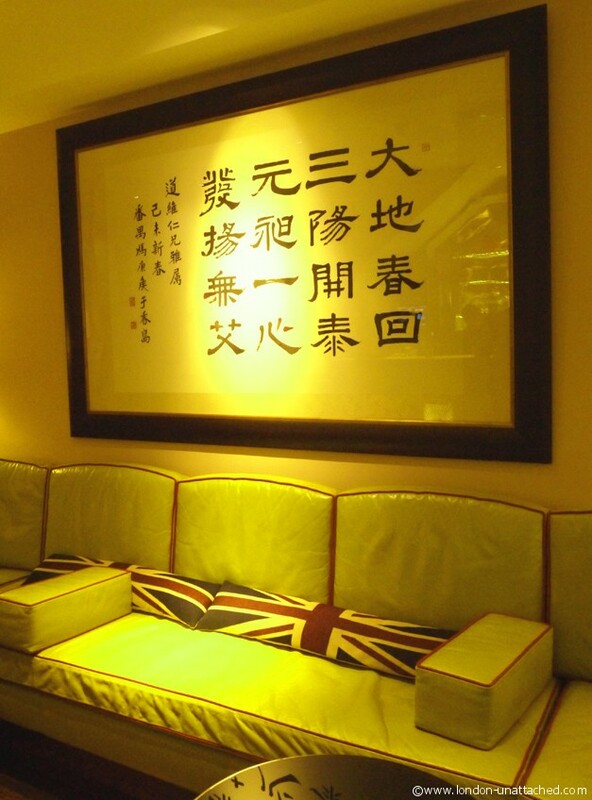 The bar seating is accommodating; lime green leather upholstered sofas spread with Union Jack cushions. There’s an old piece of Chinese Calligraphy on the wall that apparently was on the wall of the very first Good Earth restaurant on the Kings Road. And a light and spacious conservatory at the rear of the restaurant where we enjoyed something of a feast. We were greeted by Andy Kwok, son of the founder of The Good Earth, Holland Kwok. He told us that the restaurants are still run on the principles that his father established, of superb quality food cooked by passionate chefs. 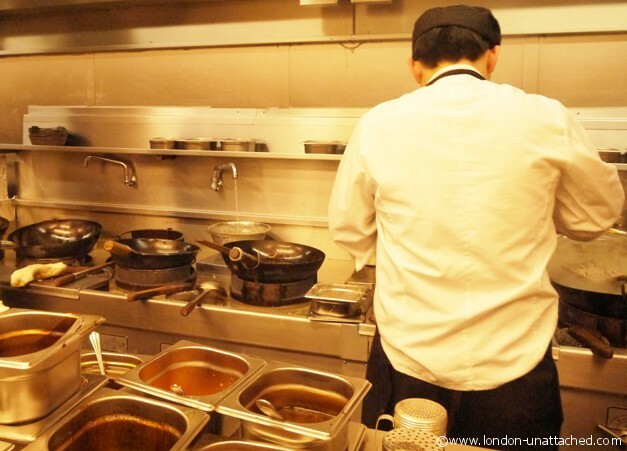 And, he showed us around the restaurant and up into the extremely efficient and fast-paced kitchen where there seemed to be a ratio of wok to chef of about three to one! 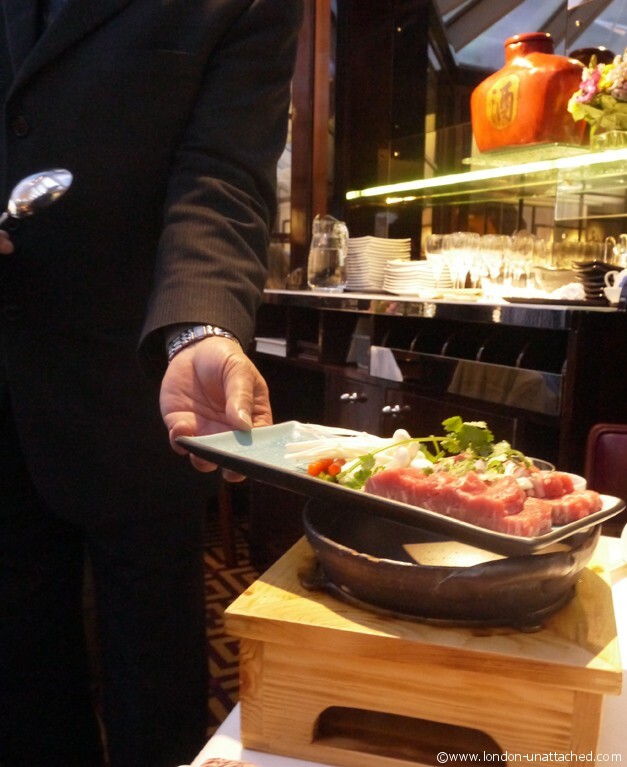 He kindly also chose for us – we asked him to select dishes that he felt would showcase the restaurant to it’s best. And, I’m sure you’ll agree when you have read on he succeeded in doing just that. 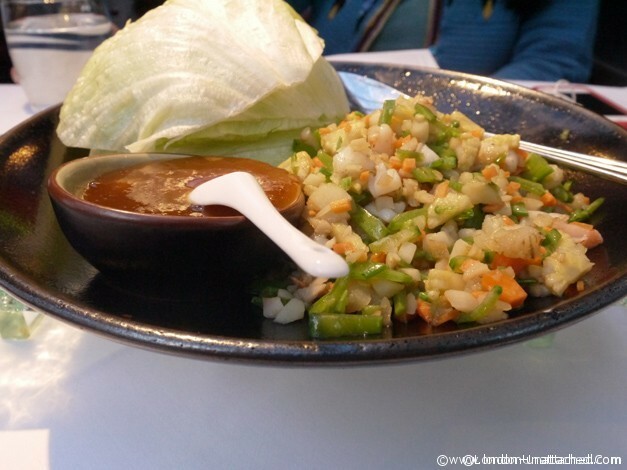 We started with lettuce wrapped seafood – a lovely fresh dish served with a sticky plum sauce. 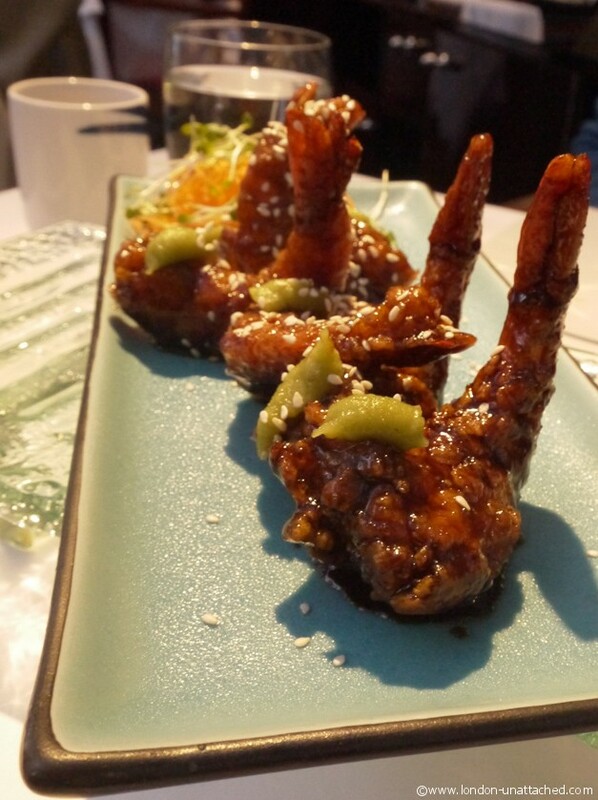 Wasabi prawns were beautifully presented and something of a delicacy. The prawns were served shell on with the heads removed, glazed and richly flavoured, with a generous and almost eye watering smear of wasabi. And, somehow, they’d been cooked so that you ate almost the entire prawn – leaving just the tail. Then, a clay pot arrived at our table. 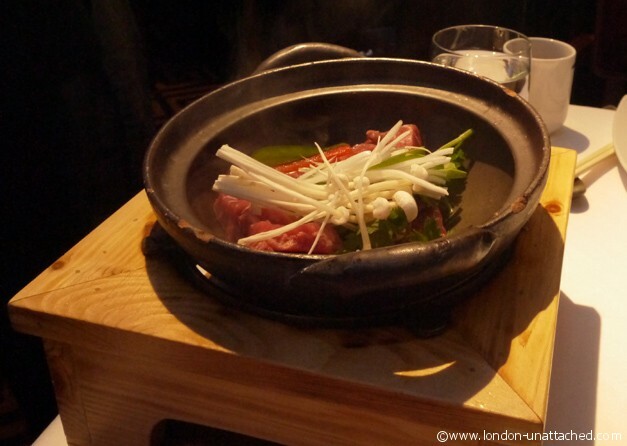 Heated to 400 degrees, the pot was then filled with spring onions, seasoning, sauce and fillet steak – stirred and covered for a few minutes to allow the steak to cook. 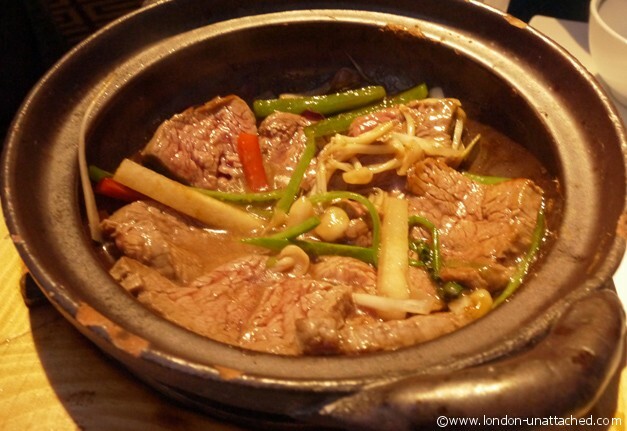 The result – a melting, carefully spiced steak dish that I seemed to keep going back to for more. Tangerine Kaarange Chicken was, so Andy told us, The Good Earth’s answer to sweet and sour chicken. 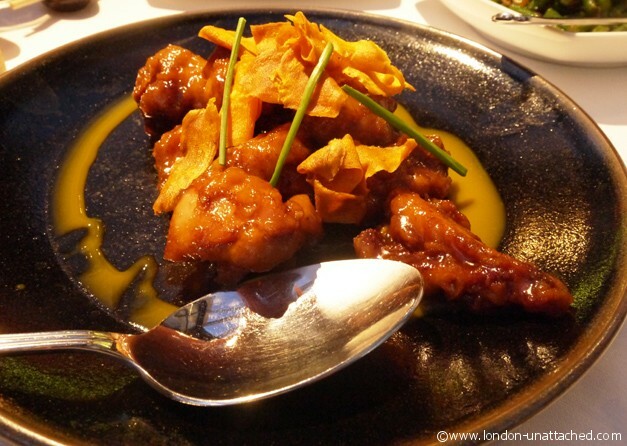 A delectable and sticky dish of tender sweet chicken marinated in ginger and soy that tasted every bit as good as it looked. And, the curiously named Golden Sands Dover Sole (I couldn’t help thinking of seaside resort brochures) were delicate goujons of sole in a spiced egg, coconut and curry leaf coating. We did manage some green vegetables in the form of dry fried french beans with dry shrimps. Though they somehow didn’t feel like part of my five a day…far too tasty. 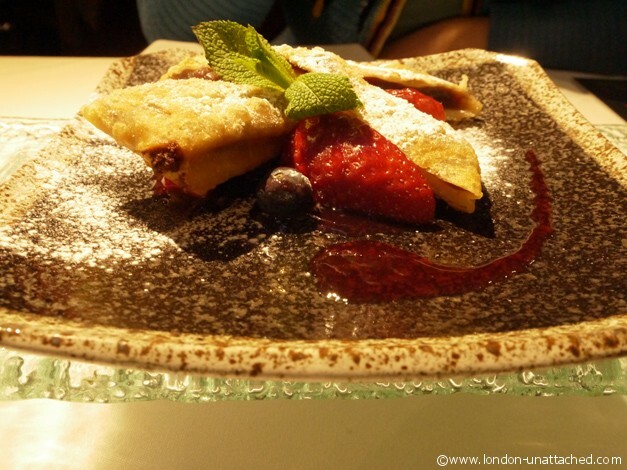 And then, despite all of that, were cajoled into red bean pancakes…with no regrets at all! I thoroughly enjoyed my meal at The Good Earth. There was a warm atmosphere in the restaurant, perhaps helped by the colours, the rainbow stained glass and fish panel on the wall. Something about this place made me feel happy. And that was without the food, which simply made the evening perfect. Red bean pancakes!! that is worth the trip. Also into the lettuce wrap variation..looks like a fun time, Fiona, as usual. I’m a huge fan of those lettuce wraps at Asian restaurants, and have been wanting to try them at home for a while now. Seems easy enough?! ;-) Everything looks scrumptious!